Somatoline Cosmetic Int Nacht 7 + Cellulite Oil Serum Duopack Promo 375 ml order online. Today women who want to lose weight expect not only that the treatment is effective, but also that it works quickly and guarantees results. Somatoline Cosmetic Slimming Intensive Cure 7 nights helps to combat local fat and promotes the drainage of excess moisture. 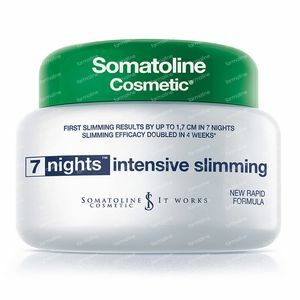 Therefore it has a slimming effect in only 7 nights. Clinical tests prove it in 100% of tested cases. Apply the product every night for at least 7 days. Rub in a circular motion from bottom to top, until the cream is fully absorbed. To double the performance, you should use the product for 4 weeks. The treatment can be repeated several times per year. After a few minutes of massage, you can feel some heat, possibly with slight tingling and possible temporary redness. The emergence and intensity of these possible reactions - which disappear completely after 30 minutes - can vary depending on the sensitivity of the individual. In fact those are the signs of the effect of the innovative cosmetic product. These symptoms are transient and should not be confused with intolerance to the product. In case of too intense redness wash the skin with cold water. After application carefully wash hands. 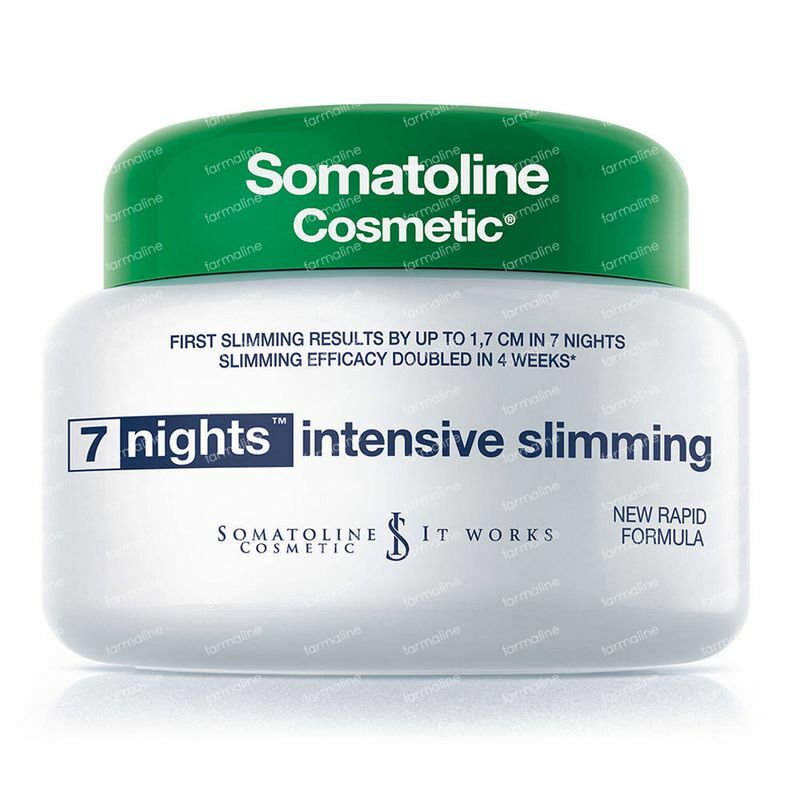 Somatoline Cosmetic Slimming Intensive Cure 7 nights includes the PhytoSlim 7 complex, an exclusive complex of natural active ingredients: sea salt, a mixture of brown algae, pink pepper, caffeine and seaweed to prevent storage. It acts as a shield that fights against absorption of fats and sugars through the adipocytes. Also contains a lot of shea nuts and white clay from the Amazon region, which forms a film on the skin, creating a cocoon effect. Ethylnicotate (causing redness) finally, facilitates the microcirculation of the skin and thus potentiates the effect of the slimming agents. This innovative complex is the result of advanced research. It works at night, when the tissues rest and are most receptive to active ingredients. Lipolysis is then more easily activated and the excess moisture is drained easier thanks to the horizontal attitude.